Imagine having your garden and plants grow indoors all year long! Having fresh vegetables and plants so easily accessible through the winter months. Growing plants indoors has become very popular and is continuously expanding. Luckily, you do not have to be trained in the farming industry for this. This is quite possible for anyone with the right sunlight, window space, and time. But, why would you want to grow plants indoors you may ask? There are many benefits to this that we’re about to discuss. Plants go through a process termed photosynthesis, where toxic air is taken in and fresh air is exposed to the environment. Having plants indoors will help to purify the air around. Plants such as herbs, lilies, aloe and palms have been seen as a great natural way to filter the air in your house for a healthy living environment. It has been said that exposure to plants can boost memory and focus. Plants such as cacti and ferns are perfect for an indoor environment to help us balance our lives. If you or a member of your family have trouble concentrating, this may be a good natural way to help. Many plants are beneficial for medical reasons and can be used as first aid. Aloe Vera can be very helpful in healing burns and lavender can aid in well-being of a person. So if you run out of Neosporin or any burning cream, no need to worry, you have plants nearby that can help. Growing plants such as a lemon trees or orange trees can help with filtering out germs indoors and balancing humidity levels in the house. This in turn can help to boost the immune system. The more plants in the house, the better the quality of the air indoors. Growing produce plants such as tomatoes, carrots, avocados, mushrooms, lemons and carrots, to name a few, is beneficial in having fresh produce easily accessible to you when needed. This reduces the worry if SHTF with terrible weather conditions and outside temperatures. This is a good way for a prepper to be prepared for TEOTWAWKI. Another benefit of growing plants indoors is for a beautiful décor. Having blooming flowers and colorful plants will spice up the atmosphere of any room adding a nice touch. The smells of the herbs also add a great touch to the smell of the air. Listed below are some of the most popular plants; vegetables, fruits, and herbs that are easy to grow indoors. All of these plants are very beneficial for a prepper in case of a SHTF situation. Avocados are a great source of vitamin B, E, and A. They have been greatly beneficial in reducing heart disease, eye problems, and risk of cancer. It is best to grow an avocado plant starting from a drawf avocado plant. You can plant this in a pot with a potting mixture and draining holes at the bottom. Avocado plants need to be watered and pruned regularly, but not overwatered as they do not do well in soggy soil. It is best to place an avocado plant in a place with a high ceiling as it can grow all the way up to 10 feet tall. Avocados are ready to be harvested when their peel turns almost black. They can be left on the tree for a few weeks at this color, but will start to loose flavor and become a soft texture with time. Carrots are a great source of many vitamins and minerals, the most popular being Vitamin K. Carrots are also a great for keeping eye health at its maximum. Growing carrots indoors starts with a pack of carrot seeds that are placed in a window box or pot with drainage holes at the bottom. You will need humus-rich potting mix to plant the seeds. Carrots grow best in areas with a ton of sunlight (near a windowsill) and moist soil. Carrots are ready to be harvested when they are about ¾ inch thick lengthwise. To pick the carrots off the plant, you wiggle them out at the root and pull straight up. 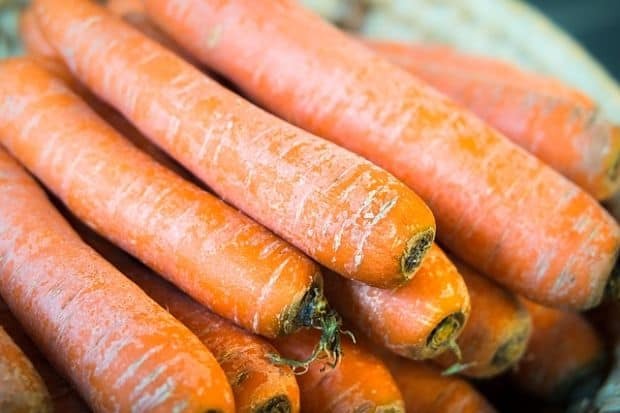 Remove greens from carrots immediately, dust off any dirt, and let them dry prior to cutting and eating. Tomatoes are a source of antioxidants that are very beneficial in reducing inflammation and coronary heart disease. Tomatoes should be grown in a minimum six inch size pot in a potting mixture. 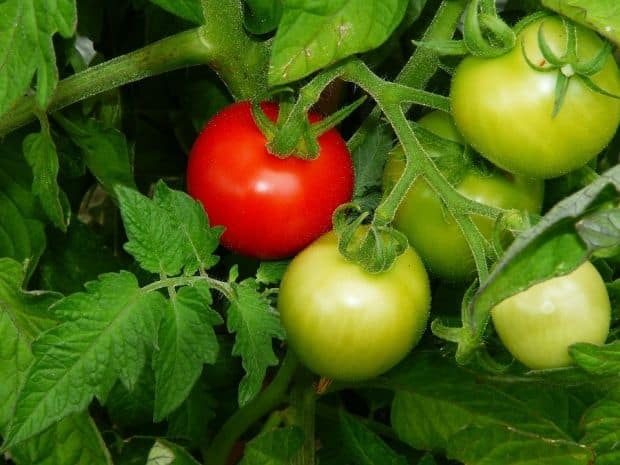 The tomato seeds should be planted ¼ inch deep into the soil, and should be watered very frequently. Make sure to keep the pot in an area with great sunlight and turn the pot throughout the day so that all sides are exposed to the direct sunlight. Tomatoes grown indoors will not grow as large as they will outdoors. When they are light red in color and firm to touch, they are ready to be picked and eaten. You can remove the tomatoes by clipping them off the stems or gently twisting and pulling. Lemons are filled with Vitamin C and are a great source of antioxidants that are beneficial in reducing inflammation, reducing risk of heart disease, and reducing risk of some cancers. Starting a lemon tree with a dwarf lemon tree is the best way to start growing your tree. Lemons are grown best in a clay, plastic, or ceramic pot filled with potting soil for citrus trees. Pots with several small drainage holes is the best choice so that they still have some room to breathe. 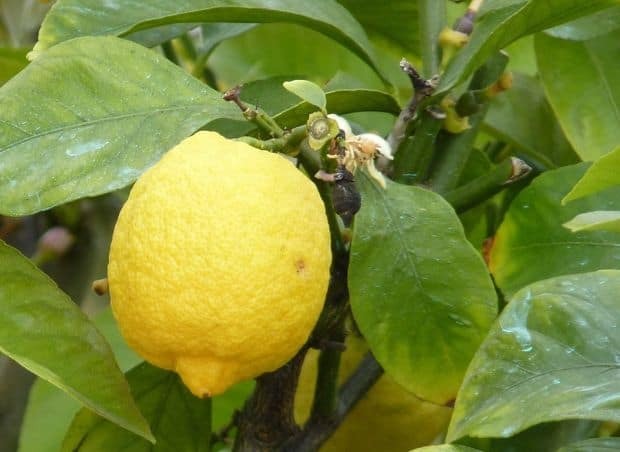 Lemons will be ripe within 6-9 months. You can tell when they are ready to harvest based on their yellow color and texture. Squeezing the rind and having some squeezing capability will indicate that they are ready to be picked. 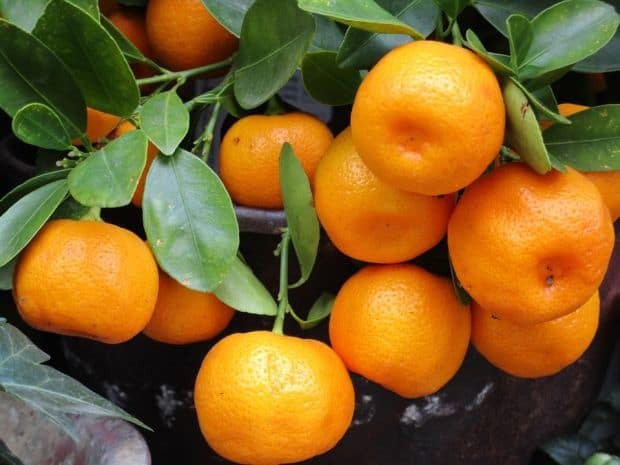 Mandarin Oranges are a great source of calcium, fiber, magnesium, and antioxidants. These oranges grow best in spacious pots with drainage holes at the bottom. Starting with a dwarf mandarin orange tree is preferred. They require a rich soil, a sunny location, and regular watering for best results. The oranges need to be harvested as soon as they are orange for the best flavor. They can be twisted or clipped off the stem to be removed. Aloe plants shelf life are very beneficial for medical needs such as soothing burns on the skin. Aloe plants prefer dry soil, so it is best to avoid watering the plant frequently. Aloe plants grow about 3 feet in height so they are best to be placed in small, indoor space. 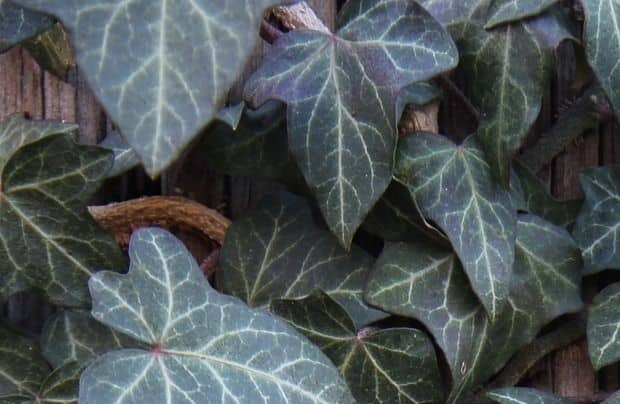 An English Ivy plant will add great décor to any space in the house. Its elegant looking leaves can trail down furniture or wall spots for a pretty effect. It is very easy to start growing an English Ivy plant by starting with a section of a stem cut off from another plant. They grow well in moist potting soil and prefer cooler temperature conditions between 50-70 degrees. This is an herb that has ant-inflammatory benefits and acts as a great herb in cooking many dishes. A basil plant can be started by purchasing seeds and planting them in a pot that is at least 5 inches wide with many drainage holes. Basil likes the warmer temperatures and a lot of sunlight, so they are best grown in a sun filled window space. Basil should be watered about once a day for maximum results. Basil is ready to be harvested when the leaves are green in color and can be picked by snipping a few leaves off the plant at a time. Rosemary is an antioxidant that helps to improve cholesterol levels and reduces risk of weight gain. Rosemary seeds can be planted in a pot made up of a mixture of potting soil and coarse sand. The soil needs to be alkaline so one teaspoon of lime needs to be added for every five inches of pot. 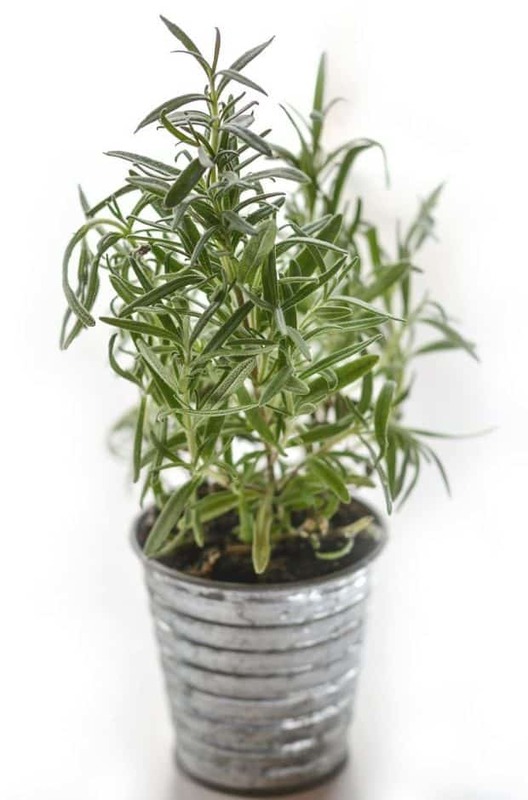 Rosemary does well in a sunny area inside the home and direct sunlight for 6 hours a day and is ready to be watered when the soil is dry to touch. To harvest rosemary, you can snip off the springs from the plant. Make sure not to remove all at once. Chives are a rich source of vitamin A and C as well as high in antioxidants. Chives start as seeds that should be planted in a large pot in potting mixture. The seeds should be covered with a light layer of soil and the pot should be placed in an area of the house with a lot of shade. 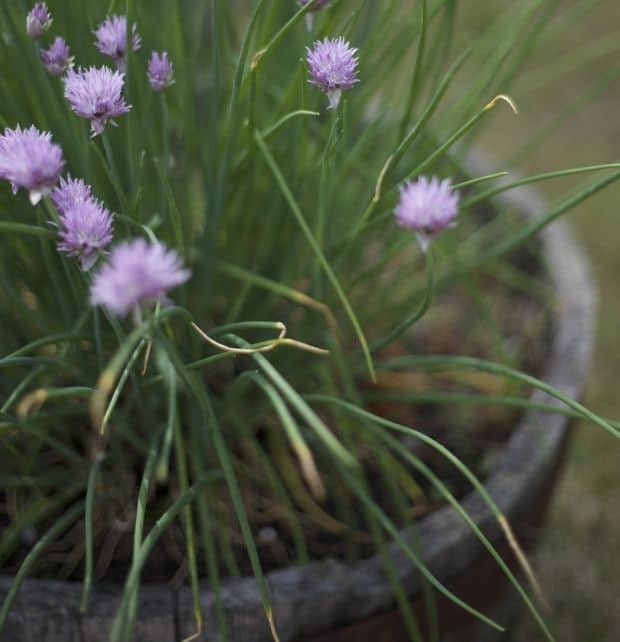 Chives should be watered frequently to avoid the soil from drying out. When ready to remove the chives, gently snip the leaves from the plant. Make sure not to remove all at once. These are just great for your survival stockpile. You can grow them in something as cheap as plastic buckets. Just remember they need watering and sunlight, so you’ll have to keep them by the window. These are some general growing tips to keep in mind for growing any type of plant indoors. By following these general tips, you should have no problems growing plants indoors. All plants require a good size pot with good draining. So it is important to get a pot with drainage holes. Many plants require a lot of sunlight, so it is important to place those plants near windowsills or doors where the light is shining throughout the day. If you do not have any area indoors with direct sunlight, growing lights are beneficial to help aid in this process. Make sure each plant has the appropriate type of soil. Potting mix is most popular for most plants, and can be purchased from the store or created on your own. Growing plants indoors has become increasingly popular. Many people think of spring time as planting season that is underway, however, you may be overseeing some valuable growing space, right in the comfort of your own home. There are many benefits that we covered for growing plants indoors as well as many of the popular plants that are capable of being grown indoors. By following the general growing tips for indoor plants, you should have no problem getting your indoor garden started. So what are you waiting for? Get planting! Next Do Burglars Avoid Houses With Dogs? I wonder about if it is possible to grow warm weather plants in Winter – tomatoes, for example. I also was thinking that fish tank heaters might be adapted somehow, maybe in feeder water. Your office may have windows where you can place potted plants. We have large windows at our factory and they are filled with cactus, a ficus, geraniums, and some black walnut and hickory saplings. We also have a large tree inside the office, which makes for a great atmosphere for us and our customers, especially during the long Winter.